Taxi dad: I have a wife and two children, an older daughter and a younger son. My wife, Linda, 53, used to work in a factory, and has recently retired. She is now doing part-time caregiving work for senior citizens. My daughter, Candida, 30, used to teach and has just completed her Masters overseas. Now she is working at a training consultancy. My son, Russell, 24, completed his national service last July and recently began studies at a private university. Candida: While my parents were strict with my brother and myself during our growing up years, my father nevertheless would always have a soft spot for us. Even though we could not afford to buy nice things like a large box of colored pencils or fancy stickers, he would usually find a way to purchase them for us later on. We did not always have creature comforts, and my childhood home was a small and humble one, but nevertheless my parents worked hard to care and provide for the family. How long have you been driving a taxi? What is your daily routine like? Taxi dad: I have been driving a taxi since Nov 1998. Every morning I wake up at 3.50am and by 5 am, I am at my usual nearby taxi stand waiting for passengers or a taxi booking. While waiting, the other taxi drivers and myself would chat. We have become familiar faces to one another but we are only friends for the day before work starts. For lunch, I always have a cheap meal below $4 at a coffee shop and by 4pm, I hand the taxi over to my relief driver for the evening. I try to keep healthy by swimming, going to the gym or doing brisk walking everyday after work. What is it like balancing the responsibilities of fatherhood and being a taxi driver? Taxi dad: As a self employed low-income earner, I have to prioritise and stay focused. Health, my children’s education, and family well-being are the most important to me, all others are secondary. I am proud that my children could receive higher education, and that overall, the quality of our lives is improving. Candida: All fathers regardless of occupation impart some sort of vision or values, consciously or subconsciously, to their children. My dad loves reading newspapers, news magazines and non-fiction books and he was the one who introduced me to my lifelong passion for reading. A clear memory from my childhood is of my father reading to me at home. Perhaps it is of little surprise that I chose to pursue my passion to major in Literature in university and went on to teach General Paper upon graduation. I believe that reading is the most important skill for a child to practise and learn to enjoy. It develops empathy, a rich imagination and good language skills. I would like to contribute to or develop a reading programme for needy children whether in Singapore or overseas in the near future. Do you have any advice for fathers in the very demanding direct service industry on how to prioritize family time? Taxi dad: I would advise fathers to know what they want and plan their time accordingly. They must always earn enough to provide a better quality of life for their family. Spend time with your family after work. As we have very limited free time in the evenings due to our early working hours, prioritize family time first above other social activities. How has being in this industry influenced the way you teach and provide guidance to your children? 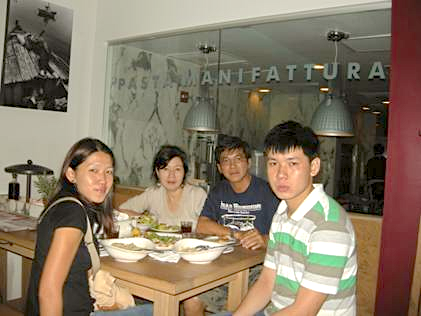 Allan and his family (wife-Linda, daughter-Candida and son-Russell) enjoying a meal together in a restaurant in Washington DC during their family holiday to the States in 2011. 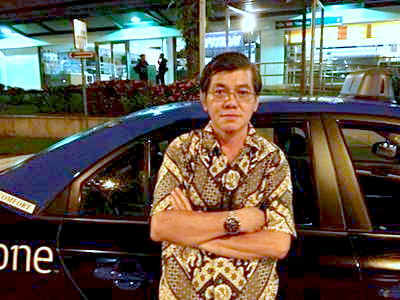 Taxi dad: Taxi drivers meet many rude and demanding passengers, even people of my children’s age. I always teach my children the value of politeness, respect and empathy, especially for people who are serving you or who are less fortunate. For example, always say thank you to the people clearing your tray at the busy hawker centre. Their work is hard and a thank can make their day. Also, in life, expect the unexpected. It means to be ready to do a deed of kindness even in the midst of your everyday work routine. I have given passengers from government rental rooms a free ride to their destination. A few times I see people walking along the highway due to a car breakdown and I send them, for free, to the nearest public transport (point). Be focused on your work but do not let opportunities for kindness pass you by. Do you have any interesting stories of your experiences on the road to share with us? Taxi dad: Being literally on the move all day, you will witness more dramatic moments of crisis. Once, in Jurong, someone stopped me and directed me to a nearby accident spot. It was frightening to see two motorbike accident victims on the road, bleeding profusely. One even had a piece of flesh hanging off her thigh. I rushed them to the nearest hospital A&E, declined payment, and then went to the closest petrol kiosk to wash the blood off the backseat. The other story was really a close encounter with danger. I had received a booking from a lady to travel from Orchard Towers to Jurong. Just as she was boarding the taxi, two men suddenly rushed out from nowhere and came into the cab. They demanded that I send all three of them to a hotel in Balestier and threatened us with violence when I tried to resist. At Balestier, the woman refused to alight. She clung onto the door as the men tried to pull her away. It was only when I told them that I would call the police that they angrily walked away. On the way to Jurong, the lady told me that they were just casual acquaintances at a bar in Orchard Towers and what happened was completely unexpected. Share with us some of your more significant family moments. Taxi dad: I am proud to have sent both my children to university and to have improved life over the years for my family. Like any other father, I am proud to have witnessed my children’s graduation and subsequent career undertaking. In 2011 I took the family for a surprise 3 week trip to the States. We do not have many overseas trips together, and it was a real eye opener to be able to learn and experience how people in other countries live.